New Year. New Watercolor Set. New Illustration. I received a Sennelier half-pan set of watercolors for Christmas. From an artist’s perspective, it’s so beautiful! I love how the tin is designed and structured. Sennier has an acetate printed over sheet that slips over the paints to not only protect them, but so you know what the name/number of each color is too. On each half pan you can find the number of each color as well, in case you discard the sheet. Anyway, normally I use Winsor & Newton tubes of watercolor, but I’ve been dying to try a pan set. It would be a different way of working with paints for me. The beginning of the year is a good time for exploring new things I always think. For as far back as I can remember, I’ve used Winsor & Newton watercolors, and so I’ve always been curious how other brands would compare. I love the assortment of colors in the set, as well as how they blend with water. I felt like quality-wise they definitely were as great as the W&N that are my golden-standard. As my first pan set, I’d give this set an A+. I can’t wait to dive into more of the colors and get started on something new! Since we’re talking about wonderfully designed tins, I’ve figured out, that I have a thing for products that come in tins. I remember my parents buying chips, crackers and popcorn in tins. I also remember getting a watch in a tin when I was young. I saved that tin for the longest time — in fact, it might still be in my desk drawer full of paper clips and other random small things. Anything, that has a tin, immediately grabs my attention. Hello, Altoids! Although, I prefer the small Altoids over the large ones. As you can see from looking at my portfolio, I work on a lot of vintage items, especially those from the Mid-Century period. So, why not a tin of Band-Aids to add to the collection, right?! 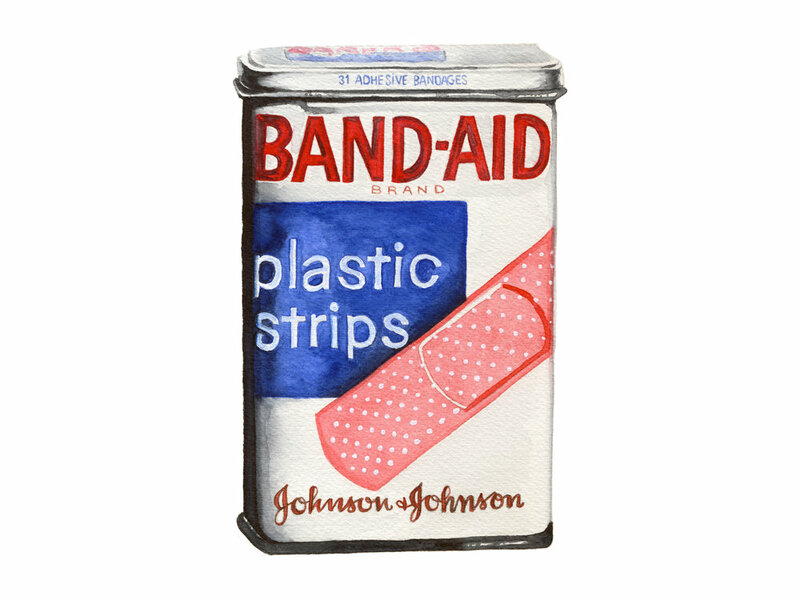 The Band-Aid tin will soon be available for get well cards and art prints in my shop, as well as in the shops that carry my work. Please always call ahead to see if this available before making a trek to any shops/galleries that carry my work. They do not all carry the same products. Alternatively, you can always contact me! I’m always happy to answer a question or comment about my artwork. Thank you!